How can Cluep impact YOUR brand? Cluep’s mission is to help brands connect with people emotionally through artificial intelligence (AI). 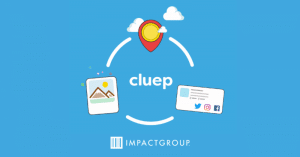 Utilizing proprietary technology, Cluep allows brands to connect with their key consumers in a more relevant way by analyzing what they are publicly saying on social media, what images they are posting, and what places they visit in the physical world. Put your marketing cap on and brainstorm how Cluep’s unique capabilities can help expand consumer awareness and interest in your brand. As the marketing landscape evolves, utilizing technology to navigate various social media platforms is becoming imperative to reach the next generation of consumers. Work with Impact Group’s marketing and Cluep team to help answer questions like: Who is your current consumer? What do they value? How engaged are they with your brand? Who else should know about you? What are your goals for 2019? Cluep is a marketing tool to help expand brand engagement and target current and prospective consumers based upon lifestyle, personal interests, and demographics. It differs from other sales tools we provide, but is an excellent opportunity to generate new interest, keep your brand top-of-mind, and create loyal customers for years to come! If you are interested in creating your own Cluep campaign, please reach out to travis.kiser@impactgrp.com to begin the process.